I recently wrote about my initial experiences with the Instant Pot, which were, on the whole, favorable. In particular, I praised Melissa Clark's Dinner in an Instant, which contains 75 recipes expressly designed for the Instant Pot. 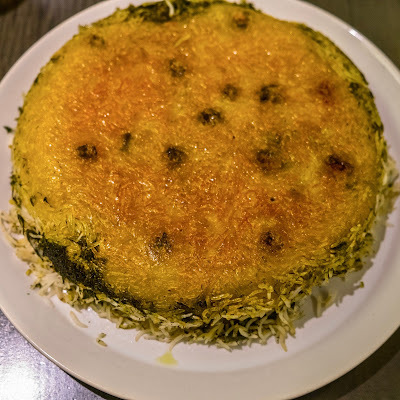 Since then, I have cooked her Green Persian Rice with Tahdig (crust), an authentic take on this Iranian treasure, made with copious amounts of dill, parsley, chives and cilantro. This was my second try on this recipe, and this time I followed Clark's suggestion and got a non-stick insert for my Instant Pot, which enabled me to be more bold about frying the steamed rice. I may go a couple of minutes longer next time, but this was plenty crispy, as you can see. I have done several other recipes from her book with great success and one that didn't work for me. The good ones were Garlicky Cuban Pork, Duck Confit (it's probably worth getting the pot for this and the Persian rice alone), Braised Italian Style Pork, Osso Bucco and Polenta (effortless, which is great, but a little lumpy, which required some serious whisking). My one failure -- and it was not really so bad -- was the Butternut Squash Soup, although in fairness I added too much liquid so had to reduce it for longer than normal. Together with the ones I mentioned in my previous post, that's ten recipes from the book, and I'm by no means through. So get an Instant Pot and get Clark's book. You won't be disappointed.